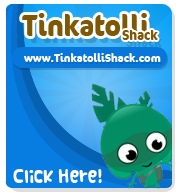 Today Tinkatolli released on the Tinkazette that ghj won Tinkapad of the week! Here is their awesome pad! I think this pad is awesome! I love the face on the inside. The black flowers are awesome too!